So what do Le Mans and the RAC Rally have in common? Well on the face of it very little. But unbelievably back in the late 1950’s it actually happened. 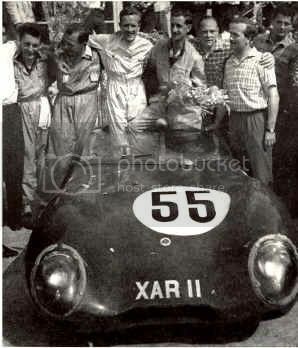 The car was a Lotus X1 reg no XAR 11 which had won the Index of Performance at the 1957 Le Mans and then in 1958 also took part in the RAC Rally, then held in March. The Le Mans car chassis 323 had a small bore FWA engine of just 743cc. This engine was put into a light weight body with a standard chassis and magnesium wheels. In this super light-weight configuration it won the Index of Performance driven to 14th overall and 1st in class by Cliff Allison and Keith Hall, beating all the more fancied French cars. The French were not happy!!! 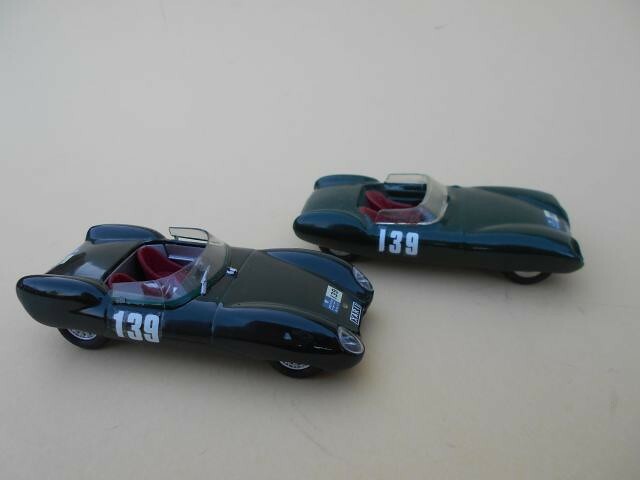 This car was then entered on the 1958 RAC Rally in a ploy to satisfy the Le Mans organisers to allow participation in the 1958 race, to prove that the Lotus was indeed a car for the road. Car number 139 driven by Edward Lewis & Denis Pratt a car least suited to the rigours of the RAC Rally, but it did do quite well on the race track sections. According to the Autosport report they struggled onto the finish in spite of holing the sump and a collision with a truck in the north east of England. 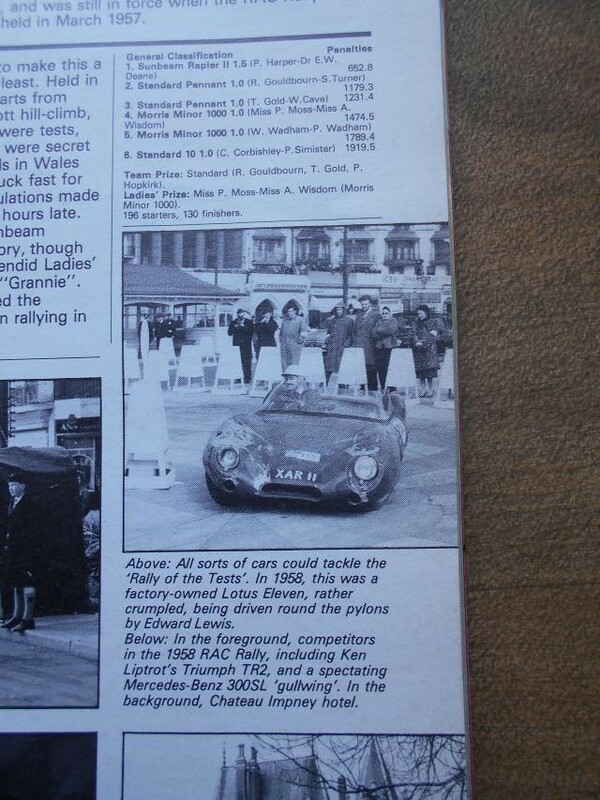 A photo appears on page 366 of Autosport 21/3/58 and on page 21 of Autocar’s 50 Years of the RAC Rally magazine. 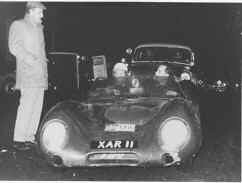 Having said all this the history of XAR 11 is further complicated by the fact that there were five Lotus X1 cars all of which took the same registration of XAR 11. 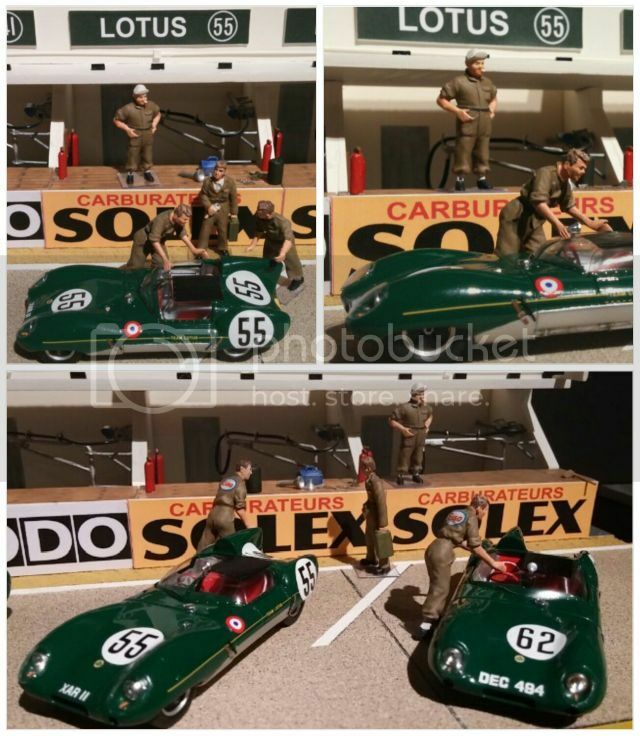 It appears that the Le Mans car and the RAC cars were actually two different cars!! Have a look at http://www.lotuseleven.org/DarkAges2/xar_11.htm for the full story. Pretty cool! Though I have the LM car, I wasn't aware of its history after La Sarthe. Very cool but unlikely rally car. Nice conversion. I enjoy learning about how different chassis were recycled for a variety of different races....something we don't see anymore. Nice one CD. This is exactly the sort of "off the wall" and unusual facts we like on this forum. Just to add to your excellent piece some more pics of XAR 11, this time at LM57. Just noticed that the Le Mans car has the head rest and fin but on the rally version its missing. Same number plate two entirely different cars!! Excellent post, nice to learn something new and I really like the cars.